The birthday of River Vitasta or Jhelum is celebrated annually by Kashmiri Pandits. The birth date of Vitasta River is known as ‘Veth Truvaha’ and the celebrations take place at Om Vethvathur (Verinag) in Annatnag district of Jammu and Kashmir. 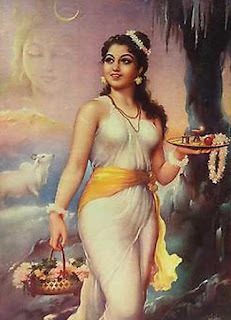 As per the stories in Hinduism, Goddess Parvati appeared as Vitasta River on the 13th day of the bright fortnight of Bhadrapad (August - September). According to Nilamata Purana, Sage Kashyap in order to save the people from a water demon drained the lakes. The demon was killed but due to the draining of water bodies the present day region of Kashmir faced severe drought. People approached Sage Kashyap to find a way to get water as the drought was getting severe and more fatal than the attack of water demon. Sage Kashyap prayed to Lord Shiva for a river which will be immune to demons and which will have good clean water. Lord Shiva agreed and he struck the ground near his abode with his trident and Goddess Parvati gushed forth in the form of a river. The opening created by the trident measured one vitasta, which is equal to 12 angulas and therefore the river got the name Vitasta. It was Lord Shiva who called the River Vitasta. River Vitasta finds mention in the Mahabharata and today it is popularly known as River Jhelum after a town in Pakistan. It plays an important role in the economy of Kashmir. It is called Vitasta in the Rig Veda. Vitasta is mentioned as one of the major rivers in the Vedas. It is believed that Vitasta is one of the seven rivers (sapta-sindhu) mentioned so many times in the Rig Veda. As per Srimad Bhagavad Purana, it is one of the many transcendental rivers flowing through land of Bharata. Jhelum River has its origin from the Verinag Spring located at the foot of the Pir Panjal in the south-eastern part Kashmir in India. The river is joined by its tributaries Lidder River at Khannabal and Sind River at Shadipora in Kashmir Valley. It flows through Srinagar, capital of Jammu and Kashmir, and the Wular Lake before entering Pakistan through a deep narrow gorge.